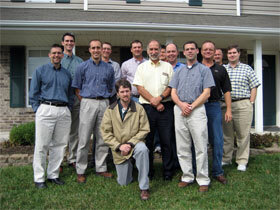 I’ve been meaning to point out the St. Josemaria Institute Podcast. I get an email notification about it and received one this weekend for the latest episode which is a meditation on the Feast of St. Mark. If you would like to know about the life of St. Mark then listen in. On April 25th we celebrate the Feast of St. Mark the Evangelist. St. Mark wrote one of the Gospel accounts and was a companion of St. Paul on his first missionary journey. However, in the Acts of the Apostles, we discover that St. Mark abandoned St. Paul, and that St. Paul would not allow St. Mark to accompany him on his second journey. In this meditation, Fr. Javier del Castillo explores the interesting dynamic between St. Paul and St. Mark, and what we can learn for our own life. The covered lanai by our pool has become my new relaxation location. 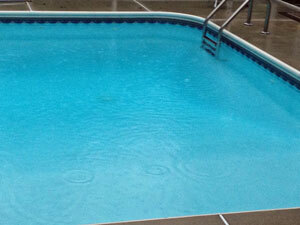 This morning for morning prayer it is wonderful since it’s raining. That may not sound like relaxation but it is. In fact, you can listen to what it sounds like below. We’ve got a tree surrounded back yard filled with frogs and birds to listen to also. So Cindy and I are finding that when it’s time to relax (anytime) this is our go to place. I’m working on an outdoor kitchen area too! Here’s a phone photo of Fr. Barry Cole and myself during my recent retreat. It was the first time I’ve met Fr. Cole and heard his meditation talks. Like all Opus Dei priests he has a great sense of humor. Thanks to John Lynch, Wespine Study Center, for taking the photo. Fr. Cole works at the Lincoln Green University Center at the University of Illinois, Urbana-Champaign. I got to visit with him before the end of my retreat and asked him to share some thoughts from a point he made in one of his talks. He talked about faith not being a private matter and that really stood out for me. I asked him to expand on that idea and what it means. We also talked about how important it is to study our faith so that we can talk intelligently about it with others. 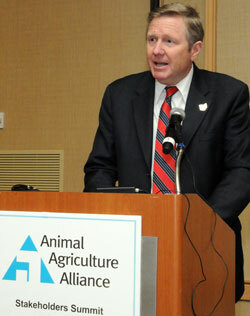 I am attending the Animal Agriculture Alliance Stakeholders Summit in Arlington, VA for my business. One of the speakers was Nebraska state Senator Tom Carlson. I thought you might be interested in a comment he made in an interview I did with him. At the conference we’re talking about animal rights activists who claim to care about the humane care of animals when in reality they have an agenda to eliminate the use of animals as food. Senator Carlson made a comparison of their agenda with human abortion where there is no middle ground on what is humane. He is unashamedly pro-life and I wish we had more of them in elected office! We’re getting closer to the theater release of “There Be Dragons.” Have I mentioned that before? We’d love to see it in mid Missouri but so far no theater has it scheduled. That doesn’t mean we’re not trying though. Tthe movie does a very good job of showing the character of Opus Dei, the Work of God, according to Paul and people I know who have seen a screening of the movie. Paul explains exactly how that comes across in his interview with Cindy. It’s all about living holiness in the everyday life we all have to live through. I can’t wait to see it! On Father’s Day I really enjoyed myself working at the Iowa Corn Indy 250 in Newton, IA. Of course I missed being with my family but I did get home at a reasonable time in the evening. Once again IRL Ministry took care of us spiritually. Fr. 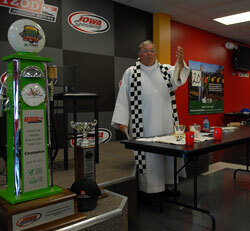 Phil DeRea celebrated Mass in the Driver’s Mtg. Room at the Media Center. One of the drivers, Helio Castroneves, attended along with team members, media and other people involved in race day activities. As a special treat, Fr. DeRea brought a number of rosaries to give away. He was in Rome on the Feast of the Sacred Heart of Jesus and had them blessed by Pope Benedict. I was lucky to receive one. 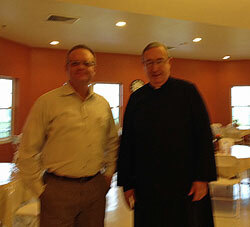 After Mass I spoke with Fr. DeRea. He says that Father’s Day is an emotional day, especially when you think of the wonderful memories of our fathers. He calls IRL Ministry a “Parish on wheels.” He, along with another minister, provide Mass and church services at races around the country. He also performs other services like weddings and baptisms. He says IRL Ministry has permission from the Vatican through Pastoral Care For People On The Move. IRL Ministry is a 501c3 not-for-profit, non-denominational organization, which was developed to help the racing community. We exist because of the donations we receive from the racing community and great partners that join with us to reach out to the people that are part of this great sport. Our financial records are available for review by contacting our office. We desire to be good stewards of the blessings we are given. I uploaded quite a few photos from the race which you can find here: Iowa Corn Indy 250 Photo Album. This week I was in Lexington, KY and attended morning Mass at St. Peter Church. To my surprise the 7am Mass is in traditional Latin. Here’s an iPhone photo image from Monday. St. Peter’s Parish hosts the diocesan Latin Mass Ministry. This ministry celebrates the Mass and the sacraments according to the 1962 Roman Missal, the rite of Pius V, and in accordance with the Motu Proprio of Pope John Paul II, Ecclesia Dei Adflicta. Mass is celebrated in St. Peter Church on Sundays at 4 pm , and daily (Mondays –Saturdays) at 7 am . Confessions are available prior to mass. Individuals of the Diocese of Lexington served through this ministry are expected to be members of a parish of the diocese, and may request the celebration of other sacraments with the permission of their local pastor. Fortunately for me they had paperback booklets with the Mass in Latin and English so I could follow along. Well Cardinal Sean O’Malley, Boston, was the first one to have a blog and now he’s got a podcast. I just subscribed and downloaded his first two episodes. The mid-Missouri Cooperators of Opus Dei got together yesterday for our monthly Circle meeting. It’s a time to listen to some spiritual reading, a meditation on our faith, conduct an examination of conscience and have time for fellowship. The presenter for us was Nate Tyson, who is a super-numerary of Opus Dei. To learn what that means and a little more about Opus Dei I interviewed Nate after our meeting. Nate talks about the structure of what we call “The Work,” how people get involved to support the apostalate and how he learned about it personally.